I've returned to Santiago de Cuba for the first time since 2010. It's also been a year since I was in Havana. There’s a saying in Cuba – “Life is hard”. It still is, but the odd mishmash of changes in finances imposed by Raul Castro over the past three years has resulted in some major and some minor changes in the lives of Cuban people. Santiago is very different from Havana in many ways. I continue to see changes, while at the same time, I can say nothing has changed. I have met some new people on this trip, who have offered to write posts about Cuba, and Santiago. Some will be posted in Spanish and English, so I can capture exactly how the natives of Santiago converse about their city. I have a great number of new photos, from the past and present. I visited many museums and met with a number of people who gave me books photos and other materials. Many historical events have occurred in and around Santiago. I am very grateful to the people who have shared their lives with me. The first of the attached maps shows the eastern area of the island, El Oriente. 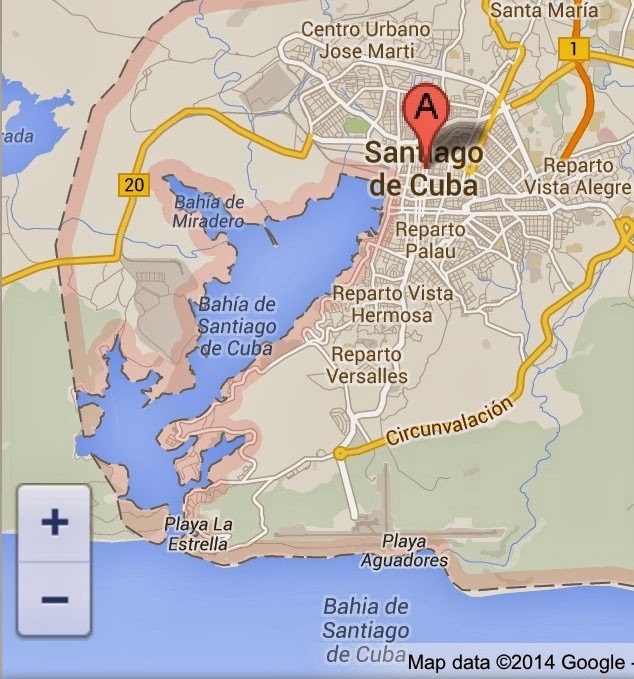 You will note how close Santiago is to Guantamo. The second one shows a closer view. You can see the harbor and how it protects the city. At the top right, the Vista Alegre neighborhood is where I stayed this time, in the home of relatives. If you trace the highway on the right, coming down from the Vista Alegre neighborhood, it leads to the Granjita Siboney, or Siboney Farmhouse, which is close to Siboney Beach. An interesting historic event called the Moncada Attack began at the Siboney Farmhouse in 1953. Both the farmhouse and the Moncada fort are museums. I visited both in 2010, but spent more time there this time. I have some great photographs of the whole area from a number of different locations, like la Gran Piedra, Boniato, and several others. You can also see how the inlet opens into a large bay and harbor, and how the town is not built in front of the open mouth of the inlet. The Morro is a fort that guards the inlet. I have old and new photos of all the areas of the city, and the inlet area. Surrounding the city on three sides is the Sierra Maestra mountaine range. It was in the hills to the west of the city that Che Guevara, Fidel and Raul Castro and many others camped and eventually succeeded in the coup that gave Castro control of the country in 1959. Stay tuned for a series of interesting information.